We fly to Gatwick, arriving about 8 a.m. the next day, pick up our rental car, and head off into southern England. Winding through narrow village streets just outside of London in morning rush hour, with Robert learning to drive on the left, shift with his left hand, and do roundabouts. Most streets and roads are two-lane, with no parking lanes or shoulders (the front-seat passenger gets a very close view of the roadside hedges.) In the towns and villages, cars and lorries park in the lanes, so driving through requires nerves of steel. Came across Newland's Corner County Council Park (much like a small U.S. state park), with a wonderful view across the Surrey downs, and many local walkers. Had chips and coffee from the stand. Found the town car park in Guildford, Surrey, and walked through the shopping mall - complete with SuperCuts and GNC - created inside several old buildings in the center of town.) Got pasties for lunch. We also went to a Waterstone's bookstore for a Michelin touring atlas. We spent our first night at Hill House, the youth hostel in Streatley on Thames, Berkshire. Hill House is an old Victorian family house in a lovely village on the Thames. On the other side of the river is Goring, in Oxfordshire, another lovely village, where we had tea. There was a rookery in a dead tree across the road, and we saw rabbits in the churchyard on an evening walk. After an English fried breakfast (bacon, sausage, eggs, beans, fried bread, toast, jam, juice, coffee, tea or chocolate), we drove on up the Thames for a bit. We stopped at a Waitrose supermarket in Wantage, Oxfordshire, where King Alfred was born, for picnic lunch and other necessities (hot chocolate mix, chocolate biscuits), and explored the market square. Then we drove southwest through Wiltshire to Salisbury, stopping to see the Uffington White Horse, with a hill fort and Dragon Hill, and the complex of prehistoric sites, including West Kennet Long Barrow and Silbury Hill, around Avebury, where we had a picnic lunch with a view of the village and some of the stones. We checked into the youth hostel, had some supper (Robert has "battered cod", which he found amusing), and walked down into Salisbury to look at the Cathedraland the close. Set off for Wales about 9 o'clock, past Bristol, and across the famous Severn Bridge, to Tintern Abbey. Driving up the Wye, one goes through a small village, around a curve, and there in valley below, next to the river is the Abbey. The day was gray and drizzling, but the roofless abbey was still astonishingly beautiful. We drove on up the Wye Valley to Monmouth, the birthplace of King Henry I. The Woolworth's and quite a few other shops were open, so we got some drawing pads for Arend, and Cadbury chocolate bars all around. Had a tradional 'three-course Sunday lunch' in a pub Melon for starters, roast beef, Yorkshire pudding, roasted and boiled potatoes, three vegetables, and apple crepes with cream for afters. Popped in to a Waitrose for a replenishment os bread and cheese, and drove through a bit more Wales and Herefordshire to Shrewsbury. The houses have changed from gold yellow stone to red stone, and the Shrewsbury hostel, The Woodlands, is a large square house of red stone, set in a garden with evergreens. Today we started of with a visit to the remains of Shrewsbury Abbey, mostly the church, which was truncated in the Dissolution and became the parish church. Walked along the Severn, which almost encircles to town, to the fair in the town park, and had lunch from an astonishing trailer - it had American flags and vendors dressed in stars and stripes - and a large sign saying "British Fish and Chips". They didn't have any fish, so we had chips with chicken curry, and intersting experience, but one which we won't repeat. Then off to Wroxeter Roman City, which was having demonstrations by a group which recreates a Roman army unit, complete with men in Roman uniform hand-sewing a goatskin tent. Hilde was even more interested in the Wroxeter Virtual Tour, available on computers in the exhibit area. Back to town to Shrewsbury Castle, which towers over the twon, and has been turned into a regimaental museum, full of British uniforms and regalia of the last few hundred years. The children wanted to go to Shrewsbury Quest, and mini-theme park inside the Abbey grounds where you can solve a mystery, illuminate a manuscripts, and visit Brother Cadfael's workshop. We dropped them there, took a walk through town, and had a beer at a pub. We set out from Shrewsbury this morning with the goal of getting past the industrial Midlands as quickly as possible. Drove through a bit more of Wales, and Chester city center, and then up the M6 - six lanes and much like a U.S. interstate. At Penrith, we got off and went west into the Lake District, on some of the roads helpfully shaded green in the atlas as picturesque, towards Ullswater. We stopped at a lovely country church and wandered about the churchyard. The caretaker, who had been mowing, pointed out the oldest gravestone - John Clark, 1746, and the children played with a black-and-white cat. Back in Penrith, we stopped at the Safeway for some shopping. They had roast chickens, so we got one, some buns, and fizzy lemonade for lunch. We took another green-shaded road northeast for the scenic route. We stopped at a pull-out on the way up a fell and sat on the grass to eat while looking at the view and the inevitable sheep. Reaching the tope, there was a car park and a cafe, a telescope and a diagram of all the visible fells. "Oh, you can see Scotland from here!" I said. "Can you?" said Robert. It was a bit misty in that direction. The fell was Cross Fell, the highest point in the Pennines. The road was engineered by Robert McAdam himself. We went on through Alston, where we were distracted by painted wooden gypsy wagons in the market into driving on the right, to Greenhead, where the hostel is in a converted Methodist church, by a tiny mountain stream, clear but brown with peat. We explored a footpath along the stream and then did some housekeeping - laundry and dishwashing, and spent some time just enjoying the view of the flagstone back garden and the stream from our bedroom window. Just before sunset (9:30! ), we walked up the valley along another public footpath to the remains of a Norman castle, avoiding the large jet-black slugs which were out enjoying an evening snack on the path. Made hot chocolate and biscuits in the hostel kitchen, and so, to bed. Visited Hadrian's Wall at Birdoswald, just a few miles from where we spent the night. After visiting the museum and remains of the fort , walked along the wall to a milecastle and back. Back to the car for a drive north into Scotland at Gretna Green, and then a loop through Galloway, including a look at Caerlaverock Castle and a visit to the Ruthwell Cross, an 8th century wayside cross, with verses from the Anglo-Saxon poem "The Dream of the Rood" carved in runes, now installed in the parish church. We stopped at the manse to get the key. This morning we set out to drive through Argyll and Perthshire, through Macbeth country and a bit ot the Highlands. After driving through the Ochil Hills, where there are many woolen mills, to Perth, we stopped at Scone Palace, More Scone Palace, where we saw Highland cattle and peacocks. The Moot Hill at Scone was where the Scottish kings were crowned, and the Stone of Scone, on which they were seated for the coronation, was kept in the Abbey there. Unfortunately, the Palace was built in front of Moot Hill, blocking its view across the countryside, and the Earls of Mansfield, who now own the property, have built their family mausoleum where the Abbey used to stand on Moot Hill. But the grounds were beautiful, and we had a picnic in the drizzle. We drove on through higher hills, ina cool mist, and came around a bend to a village beside a beautiful mountain river, runnning wide and shallow over rocks. We parked and walked into the village, which we discovered was Dunkeld , which was the seat of the early Christian church in Scotland. The chancel Dunkeld Cathedral is now the parish church, and the nave still stands roofless. 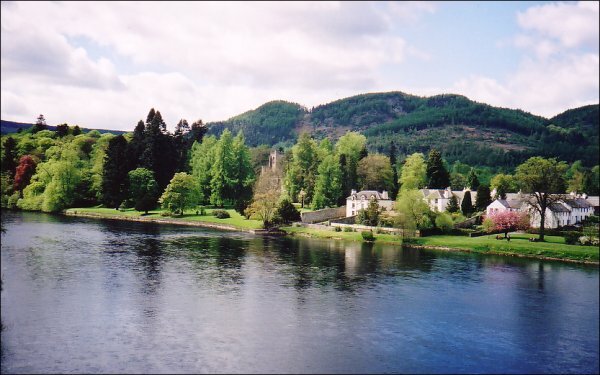 It is set in a beautiful glen, with firs and rhododendrons, beside the river Tay. We went on across a Telford bridge, through the remains of Birnam Woods (reputedly one oak, which we didn't spot), and past Dunsinane, into the Highlands, through Sma' Glenn, between mountains with almost vertical sides covered in nothing but rock, moss and heather, to Sterling. We drove to Edinburgh on the mootorway, and walked through the city to Edinburgh Castle, which is, of course, at the highest point in the city. Most charming was St. Margaret's Chapel, built at the highest point of the castle precincts, and the oldest building in Edinburgh. We also saw the Honours of Scotland, including the Stone of Scone, which has been retrned to Scotland in 1996 after 350 years in Westminster Abbey. After our tour, we walked through the old city outside the castle gates, and past the National Library of Scotland. Leaving Edinburgh, we drove down the east coast on the A1 to Holy Island, and we were in luck - the tide was out jst enough longer for us to go across the causeway to visit Lindisfarne Abbey, most famous for the creation of the Lindisfarne Gospels. Then back to Newcastle to the youth hostel at Onced Brewed, in Northumberland and at Hadrian's Wall again. We drove through the Pennines again, to Alston by a different route, and through Teesdale, where we stopped at a village bakery for bread, scones, and drinks, to Whitby, where we sat on a bench overlooking the seaside and ate our lunch of bread, cheese, and hard-boiled eggs. Whitby is now a sea-side resort, with an arcade, beach at the foot of the cliff, ice-creams, a swimming pool and kiddie rides. One little girl was actually swimming in the pool, although it couldn't have been much over 60 or so. South of Whitby we drove through North Yorkshire Moors National Park - great flat-topped hills covered with brownish heather. We drove across a road marked "Roman Road - Ancient Monument", but it was unclear where the Roman road actually was; it did lead around to Goathland, a village in the moor that was very picturesque. After checking into the York youth hostela huge old house with a lovely front garden, we walked along the river to the Lendal Bridge and then through the town to York Minster. We walked around the city wall - with wonderful views into peoples' back gardens. A museum day - we visited Jorvik Viking Center, the Yorkshire Museum , and Clifford's Tower. After that, the children declared "No more museums," so we went by the e-cafe, which kindly stayed open past their 4 o'clock Sunday closing, and checked our e-mail. We walked back to the hostel and then drove out to Stamford Bridge, where King Harald Hardradi invaded in 1066, just three weeks before William the Conqueror invaded at Hastings. Time was running short, so we ate at McDonald's, (more exotic than you might think - I had Lamb McSpicy, a curried lamb patty with yogurt sauce, and Robert had an Indian sort of chicken sandwich) before going on the Ghost Trail. We drive down the M1 from York to London. On the way, we stopped at a Welcome Break, a branded motorway service area, with gas station, motel, food court and shops, rather like the old turnpike rest areas in this country, only even larger and more unlovely. We settled into the Roebuck Hotel, near Epping Forest and the Underground, with our London A-Z, to plann the next two days. Lovely room service sandwiches of roast beef, horseradish, and tomato. Purchasing Tube passes, we set out to explore London. At the Tower of London, we took a tour guided by Yeoman Warder Roderick Truelove, and then saw the Crown Jewels, the White Tower, and the rooms where Sir Walter Raleigh was imprisoned with his family. Lunched, and then walked along the Thames, Lower Thames Street, and the Strand to Charing Cross Station and up Charing Cros Road to the West End, where we saw The Mousetrap. Stopped in a used bookstore or two, and another Waterstone's. After a side trip to the Dr. Martens department store and the mini-mall that used to be Covent Garden flower market, had supper in a little cafe near Leicester Square and caught the Tube home. Started the day with an adventure by tube, light rail, bus, and foot tunnel under the Thames to the Royal Observatory, Greenwich, where Hilde wanted to stand across the Prime Meridian with a foot in each hemisphere. Walked past the Cutty Sark, in drydock at the water's edge, the Naval College, and the Maritime Museum. There was a wonderful view from the Observatory, and a pleasant hillside garden with ravens behind it. Had chips from a stand for lunch and ate in the park, and ice cream on the walk back to the Thames.Took tunnel, bus, Docklands Light Rail, and tube back to Tottenham Court Road and walked down Great Russell Street to the British Museum where we saw the artifacts from the Sutton Hoo ship burial. People have spent lifetimes in the Museum, and just walking through the halls is overwhelming. We walked down Bloomsbury Road and had cappucino at a sidewalk cafe, and then walked down Charing Cross Road to Whitehall, through all the British government buildings, to Westminster, with Big Ben and all that, and have a picnic supper in the square while waiting for Westminster Abbey to reopen after evensong. Got up quite early, since we were not sure how long it would take us to drive to Colchester and return the car before catching the ferry from Harwich to Hoek van Holland. We made the port in plenty of time, and had a pleasant trip on the ferry, which is more a mini-cruise ship, with restaurants, movies, a casino, and duty-free shopping. We read and watched the scenery (gray North Sea). Took the train from Hoek van Holland into Rotterdam, and after some moments of disorientation in the station, found the Europcar office and picked up our second car, with the steering wheel on the right (that is to say the left) side. We drove through the Dutch countryside, complete with dikes, canals, and windmills, but did not find a place to stay until we arrived on the outskirts of Amsterdam, where we threw up our hands and stayed in the Novotel (similar to Holiday Inn). Afterwards, we had lunch in a sidewalk cafe - tostis - mine was ham, cheese, and pineapple, shopped a bit in a old building converted to a mall, and wandered, ending up at the Central Station, a huge red-brick Victorian gingerbread building. Took the tram back to our car and headed out of town through the Forest Park. Stopped at a grocery and got raisin buns, more chocolate biscuits, hot chocolate mix, bread and cheese, etc. In the next town, Otterlo, we found our first B&B. We had an attic room up a spiral staricase, with a view of a farm next door - corn field, vegetable garden, and a pen of delightful small fluffy brown and black sheep - all neatly hedged with arbor vitae so they were not visible from the street, which, on the other side, had a row of typical houses with meticulous front gardens. We walked to the center of town and bought a box of sweet cherries, and then ate at a pub - brodtjes (sandwiches) and cherry tart with cream. All ages and sorts of local people came in for dinner, a beer, or to shoot pool. Woke to a Dutch breakfast - ham, cheese, bread, jam, soft-boiled egg in egg cups, orange juice, coffee, tea, all beautifully set out. Drove up the Maas River through the Dutch countryside. Stopped at an A&P Hypermarkt, much like our WalMart superstores. Crossed over into Germany to go to Aachen , Charlemagne's capital. Paris where we checked into our hotel, La Republique, on the Rue Albert Thomas, , near the Place de Republique. Quai de ? We got our Metro passes and set out to explore.